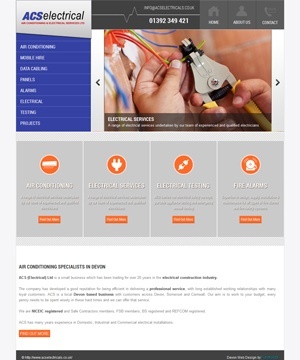 ACS Electrical already had a website before coming to us. They had had no input and were not happy with the outcome. The managing director, Shaun, wanted a website to reflect his company image.After talking with Shaun, we put together a design based on his specific requirements. I have found working with function28 a easy experience and pleasant experience they understood my requirements and with their input and fresh ideas they have produce a website which looks the way I want to be seen by my clients. Ps I find that Russell Murch talks too much about football……..I don’t really care for football I prefer golf or chess! !